1 Let’s begin by getting our pot nice and hot over medium heat. Pour some oil and throw in the garlic. Cook them until brown before adding the chicken breast. 2 Pour the water next and bring this to a boil. 3 Drop the Knorr Chicken Broth Cubes and gently place the cabbage and spring onions in. Let this simmer for two minutes and give this a nice seasoning of salt. 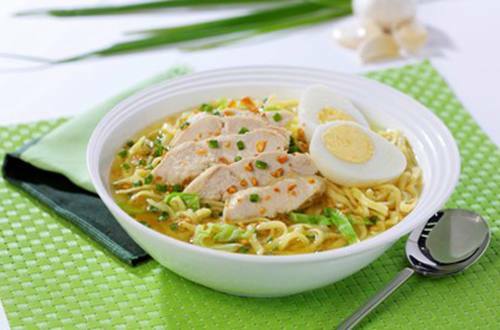 4 Now, serve the cooked noodles in a bowl with a serving of hard-boiled egg and chicken breast. Pour the cooked broth over and with a topping of chopped spring onions and toasted garlic, that’s our dish! 5 You know you are already home when you can smell chicken being cooked and garlic being toasted in the kitchen. Ahhh, Chicken Mami it is!